...as in "a break from spring". Yes, already. I'm suffering from pastel fatigue (they're everywhere) and I need a quick escape! At the same time, I'm such a seasonal person that a lot of colors feel just plain wrong and out of place right now. I swatched a matte red shimmer last week and wound up taking it off without even finishing my cleanup. It just didn't seem right. I'm left in an odd spot this time of year then, since I'm not quite ready for bold summer brights, but I also don't want to look like an easter egg. I looked through my vast collection for untrieds that seemed spring-ish, but also within my comfort zone. I found a bunch of purples, teals, etc that suited me just right and swatched a few to show you today. Love & Beauty Dark Purple is a dark purple (who'd have guessed?) with dense blue and pink microfleck shimmer. This is really a stretch of "spring-ish" since it turned out darker than I'd expected. It's quite sheer and I needed three coats for opacity. I'm almost 100% sure that it's long-gone, since I think Forever 21 changed their polish line considerably at some point since my last trip to the mall. They're not in the L.A. Girl bottles like this anymore, but a square one like CoverGirl. Orly Bailamos is a light-ish teal with a fine, dense teal shimmer. I've been trying to remember where I got Bailamos, but I'm drawing a blank. I wanna say it was Marshalls. I know I found it at CVS during their huge Orly clearance last year, but the jerk behind the counter said it was full price and wouldn't budge from that opinion. Harrumph. I was really grumpy about that, since it was one I'd wanted for a while and I thought I'd be getting it for a good price. All I know is that I found it somewhere at some point and here it is. I know a lot of people miss these old bottles, but I never liked that ugly gray cap. As for the polish itself, it applied really nicely and without brushstrokes or streaking. I love it! FingerPaints Owlin' At The Moon has pale green foil shreds in a clear base. I...I don't know! I bought Owlin' At The Moon during a Sally Beauty clearance event on a whim. It was part of the same collection as Itsy Bitsy Spider. Application was kinda frustrating, since the shards want to bunch together. I wound up dabbing it on with the brush. Do I like it? Dunno. It's unique, I'll give it that much. Milani Peacock is a sky blue cream. I love the color of Peacock, but not the formula. It bubbled and went on thicker than I like...but it still needed two coats. I may thin it before wearing it again. It's from last year's Fantastical Plumage collection which never made it onto the blog because I found it at CVS oddly late and...that seasonal issue again, I just didn't feel like swatching my picks from it in September. Sation Videogame Vixen is a mix of silver and black microglitter and small-ish hexagonal glitter in a clear base. This was a Marshall's find a while ago. I have sizeable regrets over putting a bottle of Ego-friendly back on the shelf...and then never finding another, of course. This is why I have so much polish. I hate that feeling, so I wind up shrugging and buying pretty much everything that even vaguely interests me. Videogame Vixen applies easily and is probably more wearable than Ego-friendly, since it's got a clear base, but I'll always wonder what might have been....or maybe I'll just buy it on ebay. NYC Pure Orchid is a deep, yet vibrant purple cream. LOVE!! I had a little bubbling, but I'm hoping thinning might help that. This is two coats and I'm crazy for its intensity. Hope I can make it work next time. It's from the '12 Color Rush collection, which was new right around the time I went really nuts for polish. *sigh* Memories... It feels like forever ago! I'm glad they didn't keep doing this style of bottle though. That huge cap is awkward! 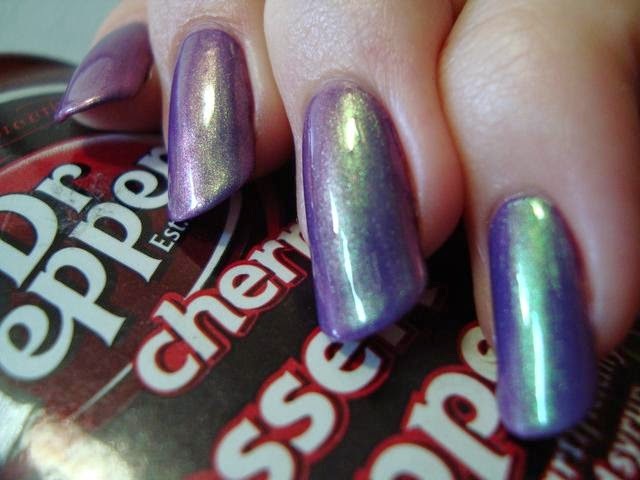 OPI Significant Other Color has a sheer lilac base with dense green-to-pink duochrome shimmer. I hope you guys enjoyed this little diversion as much as I did! I am loving the Orly color! Gorg! This was the one April Fools prank that had me laughing. This was hilarious, the carrot actually had me laughing out loud! My favorite April 1st post yet!! I ashamed it took me a little too long to figure out the first was a banana.